Roasted Turkey Enchiladas is oven roasted shredded turkey, stuffed into tortilla, topped with homemade enchilada sauce & cheese! Weight Watchers friendly- 8 SmartPoints! Hopefully by now you have a full understanding of my love for Mexican food. I really could eat Mexican food everyday. I am a native Texan, so tacos and enchiladas are a way of life. My Roasted Turkey Enchiladas are the perfect meaty enchiladas to make for dinner any day of the week. Oven roasted shredded turkey and cheese, stuffed into a corn tortilla, topped with homemade roasted tomato enchilada sauce and more cheese! 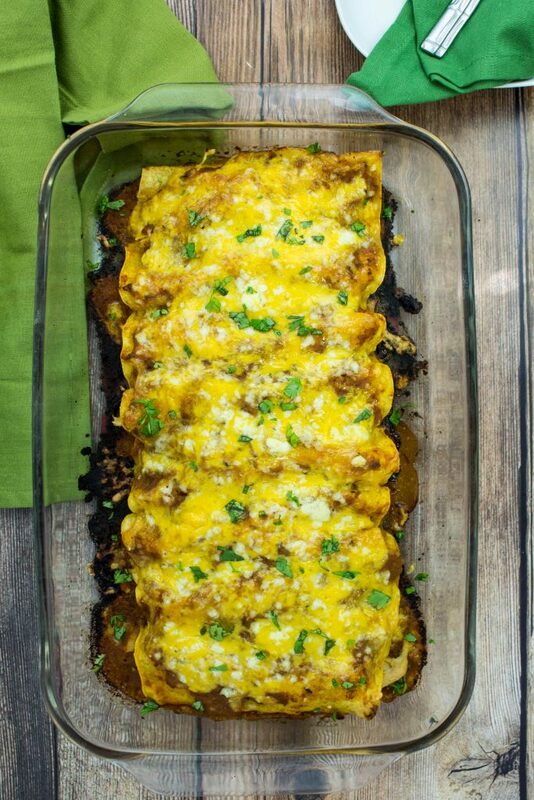 This is a Weight Watchers friendly recipe and two enchiladas is 8 SmartPoints. I’m always looking for ways to change up enchiladas by using different ingredients instead of traditional ingredients. Don’t get me wrong, I love traditional cheese enchiladas, but sometimes I want something different. Lately, I’ve been cooking with turkey tenderloin and turkey breast. 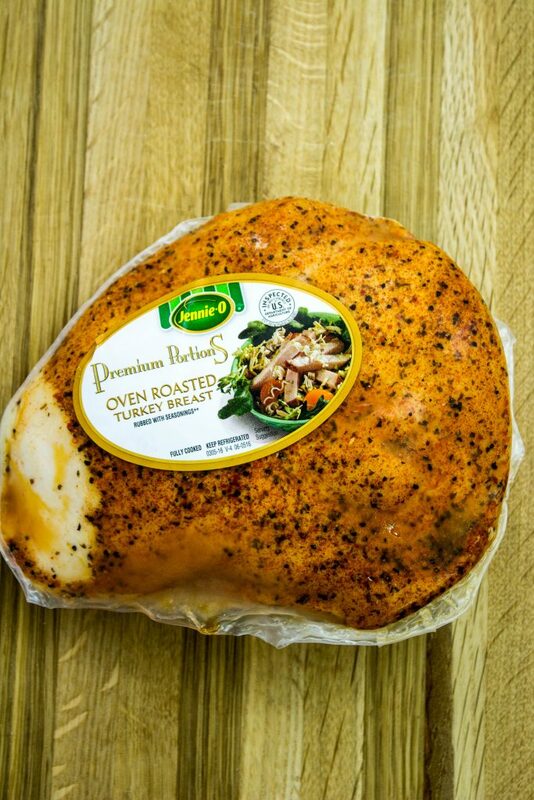 For years, I only cooked with ground turkey, but recently I found more turkey options to cook with… with is awesome because I love to try new things! A few months ago, I found already cooked oven roasted turkey breast by Jennie-O. I love Jennie-O products because they are all natural and lean cuts of meat, which works great for Weight Watchers. What I love about the already cooked turkey breast is that it was already cooked! This saves so much time for me, and I know it will for you too!!! These enchiladas are so delicious… packed with tons of meat and flavor. You honestly will have no idea that they are actually “healthy” and Weight Watchers friendly. To start, I like to make my own enchilada sauce. 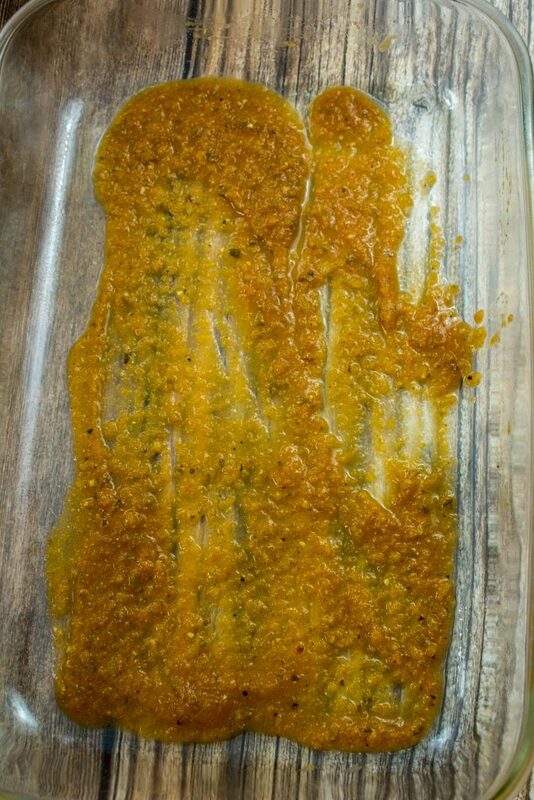 If you’ve checked out my other recipe posts, you know I love to make my own sauce. Making your own sauce not only tastes better, but ensures that you know exactly what ingredients are in whatever it is you are eating! These enchiladas are covered in my delicious Roasted Tomato Enchilada Sauce. 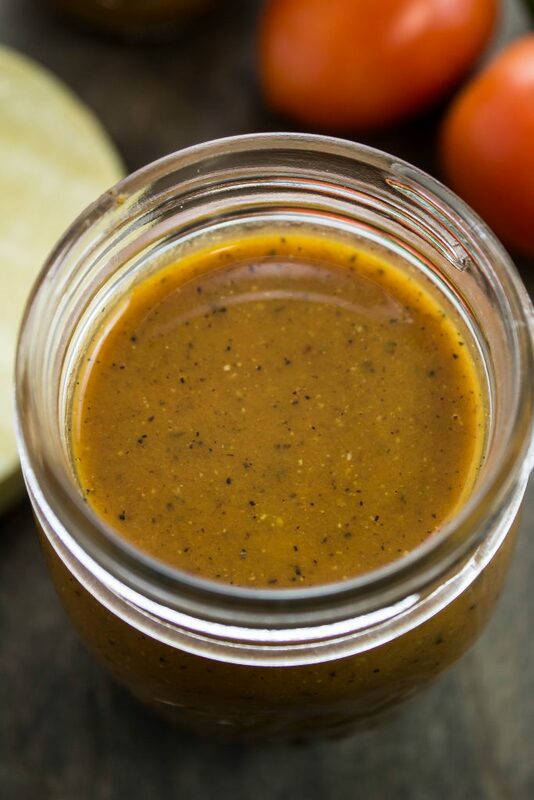 Be sure to click here to read how to make this sauce! Since the turkey is already cooked, the next few steps only take a few minutes! 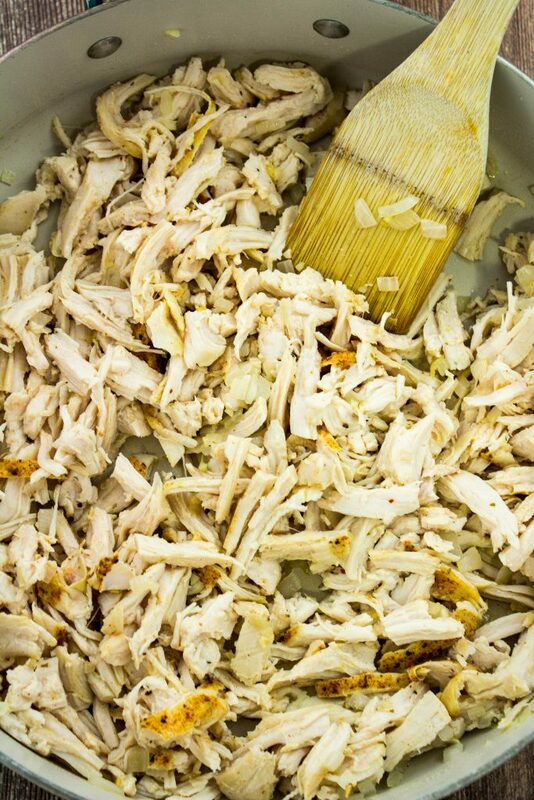 Shred the pre-cooked turkey breast and set aside. In a large skillet over medium heat, saute onion and garlic for a few minutes then add the turkey. Add a little bit of hot water to the skillet to moisten the turkey and let it cook for a few minutes. The final steps are assembling the enchiladas! Pour a little bit of the enchilada sauce into a casserole dish. Dip a corn tortilla into the enchilada mixture. 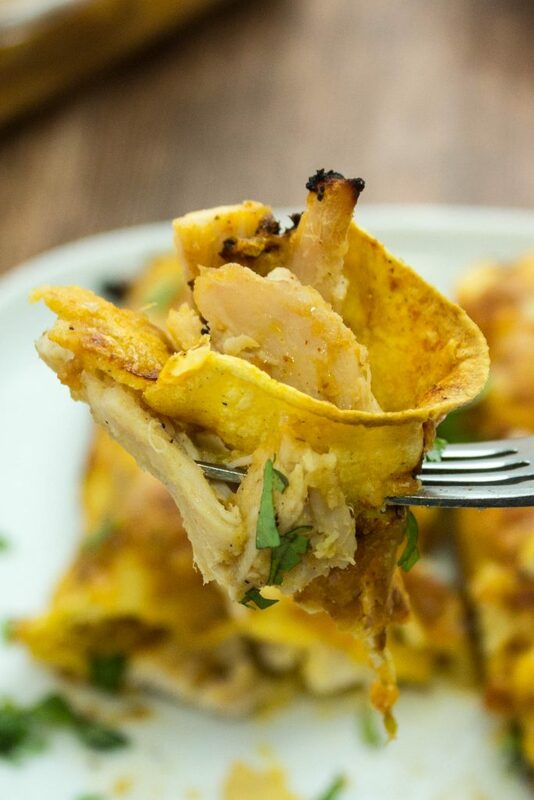 Add a few tablespoons of the turkey mixture into the tortilla, top with a sprinkle of cheese, then gently roll up the tortilla tightly and place in the casserole dish. Repeat this step 12 times! Pour the rest of the sauce on top of the enchiladas then top with cheese. Bake for 15 minutes. Remove the enchiladas from the oven and garnish with cilantro. 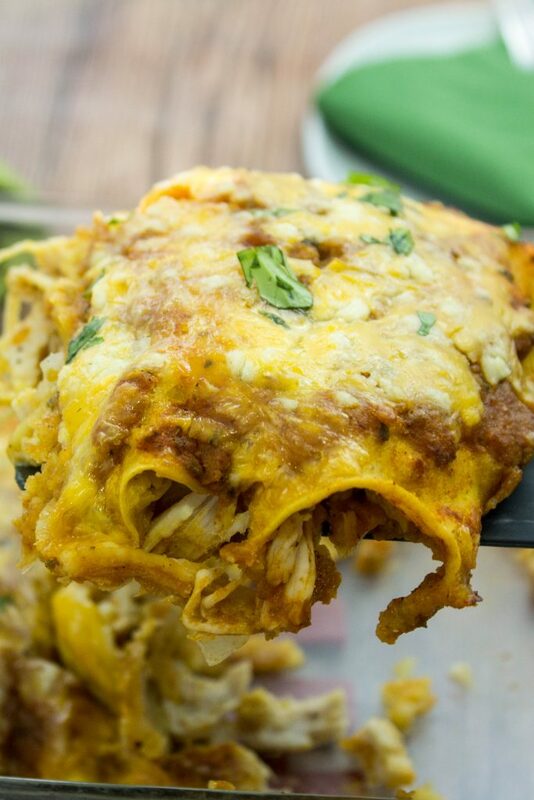 Take a break from using chicken and use turkey for these enchiladas! 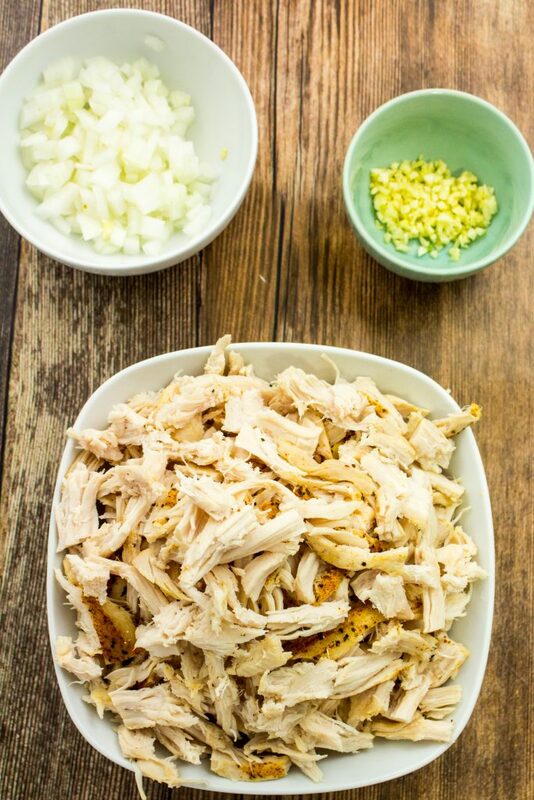 Save this recipe for when it comes time for Thanksgiving… this would be a great way to use leftover turkey. 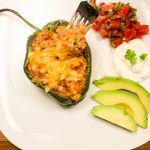 Be sure to check out my other enchiladas recipes: Roasted Tomatillo Vegetable Enchiladas, Chicken Suiza Enchiladas, Cheesy Vegetable Enchilada Casserole, and Vegetarian Enchilada Stuffed Peppers. Roasted Turkey Enchiladas are the perfect meaty enchiladas to make for dinner any day of the week. Oven roasted shredded turkey and cheese, stuffed into a corn tortilla, topped with homemade roasted tomato enchilada sauce and more cheese! 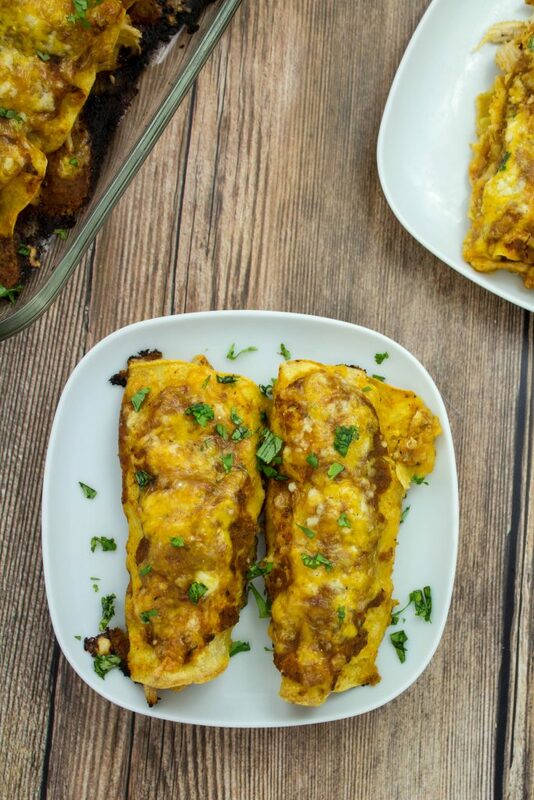 8 Weight Watchers Smartpoints for two enchiladas! Make Roasted Tomato Enchilada Sauce according to recipe instructions. Shred pre-cooked turkey breast and set aside. Add onion and garlic, season with salt and pepper, and cook until onions are translucent. Add shredded turkey and water. Mix well and cook for 5 minutes. Spray each side of tortilla with cooking spray and add to a zip lock bag. Microwave for 45 seconds. This will help keep tortillas flexible. 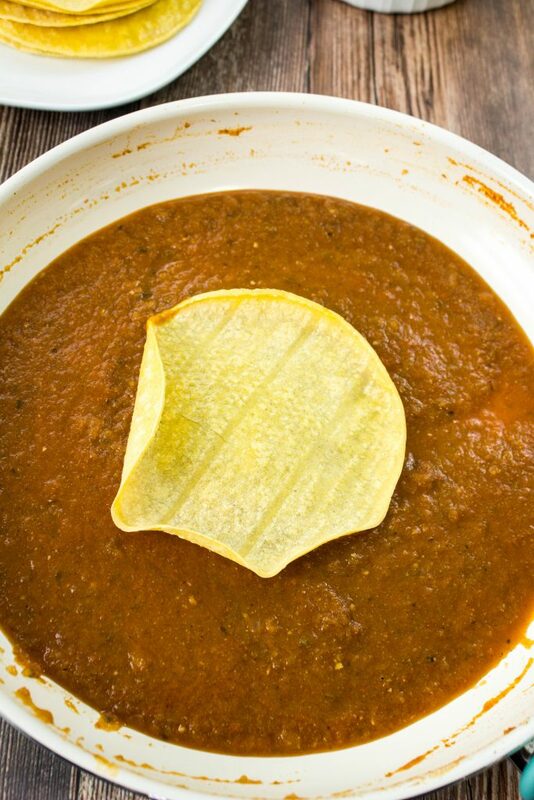 Once sauce has thickened, dip each tortilla in sauce. Fill each tortilla with stuffing and sprinkle of cheese (Save 1 cup of cheese for later). Ladle sauce on the bottom of casserole dish. 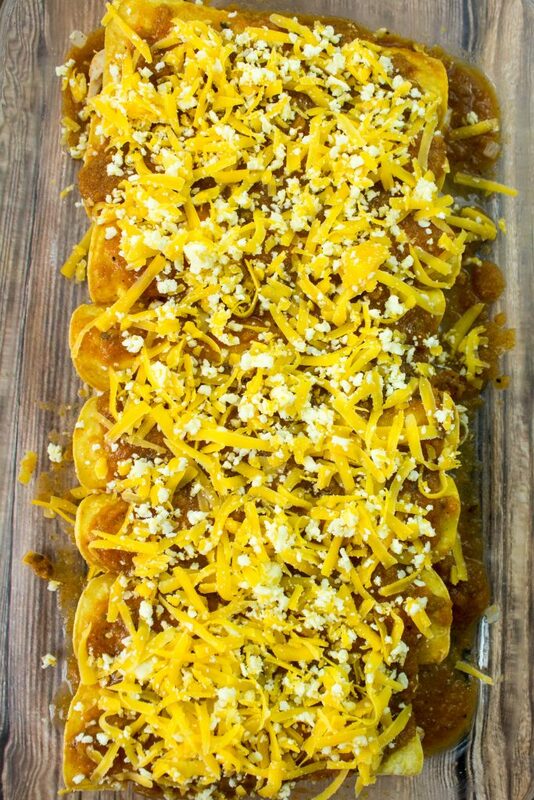 Line up each stuffed enchilada and pour remaining sauce over enchiladas. June 1, 2017 at 12:36 pm This looks so hearty and delicious! I've done enchiladas with ground turkey before, but never roasted turkey. I want to try this out soon! June 1, 2017 at 4:38 pm This recipe looks so delicious. I cant wait to try it! June 2, 2017 at 2:43 pm Let me know how you like the recipe Colleen :) ! June 1, 2017 at 5:02 pm My mouth is watering, these look so so delicious!! June 2, 2017 at 2:43 pm They really are Leah :) ! June 1, 2017 at 10:04 pm Oooh, I am going to have to make this. I cook an extra turkey just to have left overs to use throughout the year. June 2, 2017 at 2:42 pm Oh well this recipe is PERFECT :)!!! June 2, 2017 at 2:42 pm Thanks Cheyenne!! June 2, 2017 at 2:41 pm They are so good! Definitely a great use of left over turkey!! June 2, 2017 at 10:03 am I just made enchiladas and my biggest complaint was the store bought sauce. I had no idea it was this easy to make! I'm going to be making my own sauce all the time now!! June 2, 2017 at 2:41 pm Oh you gotta try it!! 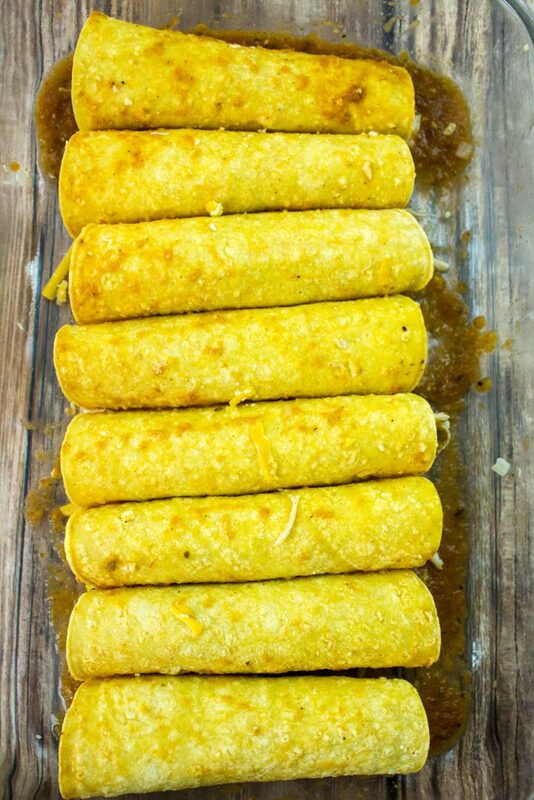 June 2, 2017 at 12:34 pm I love Mexican food and can't wait to make this for my family. Great idea to use turkey. June 2, 2017 at 12:39 pm Oh wow! 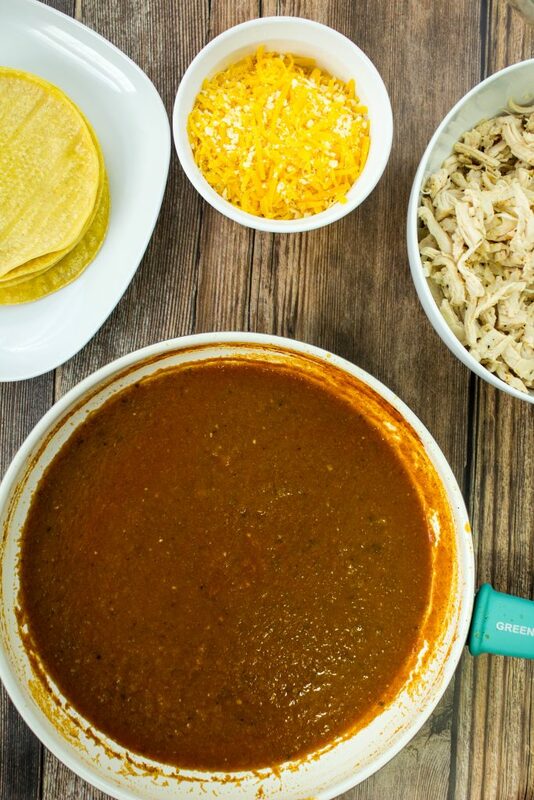 I need to try and make my own enchilada sauce! 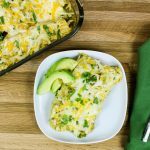 June 2, 2017 at 4:49 pm This is such a fun twist on a classic chicken enchilada! I've never made them with turkey before, so this is something that I'd love to try! June 6, 2017 at 11:06 am Oh you should totally try this recipe! Thanks Ashley :)! 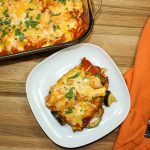 June 2, 2017 at 10:27 pm This would be a great way to use up leftover turkey after Thanksgiving! Pinning for later because I really want to try making that homemade enchilada sauce too. June 6, 2017 at 11:05 am Ohh yes totally!! I'm already thinking about Thanksgiving :) Thanks for pinning Jordan! June 4, 2017 at 8:51 pm These look great! And I'm from Texas and can be a hard critic on enchiladas! June 4, 2017 at 9:15 pm I love that you use turkey on this recipe. So healthy and looks delicious, definitely saving this recipe for later. Thank you for sharing . 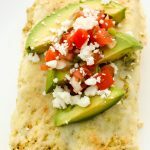 June 5, 2017 at 5:05 pm Yum, this looks and sounds like the perfect recipe for healthy enchiladas! June 6, 2017 at 11:02 am Thanks Nicole! November 28, 2017 at 1:50 am Wonderful recipes.Very nice and mouth watering posts.Thanks for sharing. November 29, 2017 at 8:39 am Thank you Pranu! I'm glad you enjoy my recipes!! December 4, 2017 at 1:01 am Welocme.I liked all the recipes very much.Waiting for more articles.